Rum Jello Shots for everyone! (21 and older, that is.) 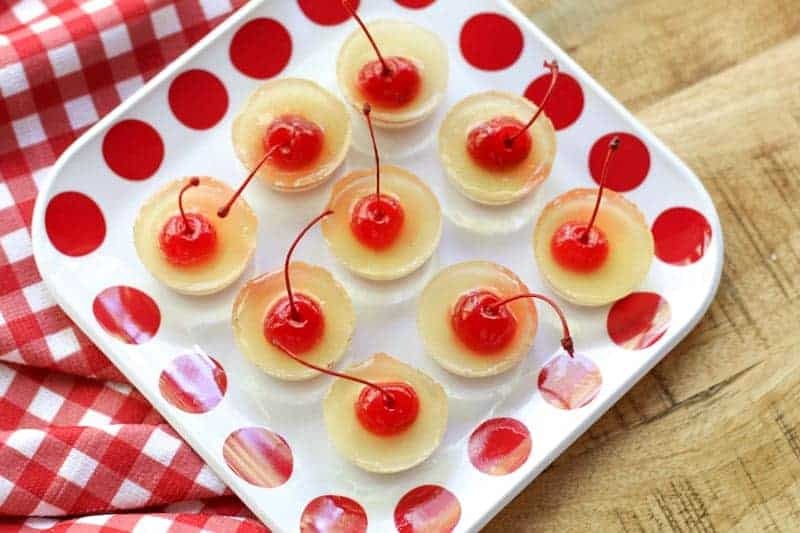 Made with all natural ingredients; these pretty tropical Pina Colada Rum Jello Shots start with a creamy coconut bottom layer, a delicious pineapple flavored center, and a sweet cherry to top it off. You can pick them up by the cherry stem and pop them in your mouth. How fun is that? This post was sponsored by Batiste Rhum Ecoiste. All opinions are mine. “Drinkin’ rum before 10:00am makes you a pirate, not an alcoholic.”-Earl Dibbles Jr. However, when they shipped it to me, I had no idea what I was really in for. Even with all that great stuff, what you really want to know is…. IS IT GOOD? Uh…. YA!!! It is freakin’ AWESOME! You want a bottle now, don’t you? Speaking of Caribbean Island; taking a sip of this stuff reminds you of all the fun times you have had on the islands drinking a (or several) Rum Punch, Strawberry Daiquiri, Mai Tai, and Pina Colada. If you can’t sail off to islands, why not bring the Caribbean to you? 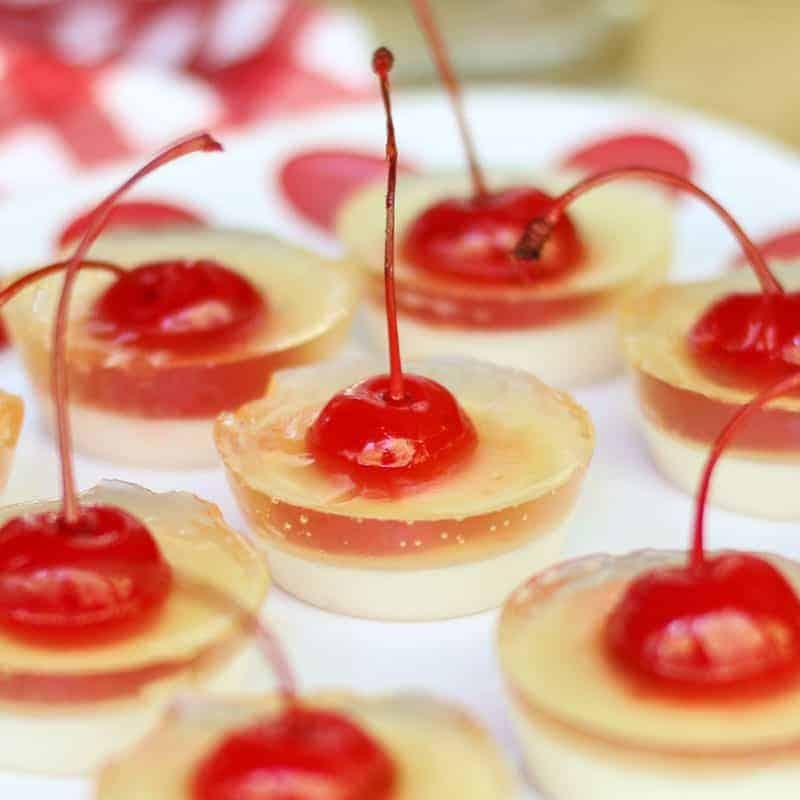 Hence, I have concocted these amazing Pina Colada Rum Jello Shots! – You are welcome!!! Making these Rum Jello Shots is easy. You spray a mini muffin pan with coconut oil. Then you make the coconut cream layer and refrigerate. After about 30 minutes or so, you make the second a layer and add the cherry. Then you refrigerate an additional 4 hours for fun Caribbean Island Rum Jello Shots fun! Rum may not fix all your problems… but it is worth a shot; a Pina colada jello shot that is! 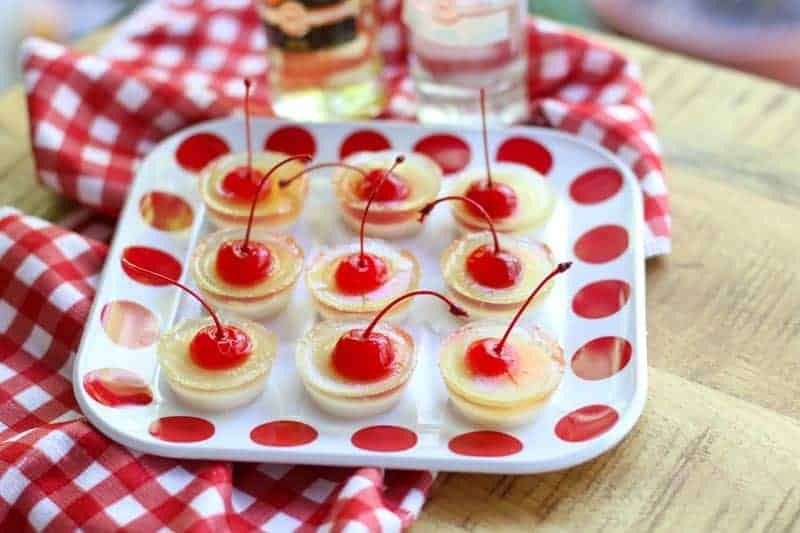 Make these Pina Colada Jello Shots for a birthday party, a girl’s night, Bachelorette or Bachelor’s Party, a Memorial Day cookout, July 4th festivities…. The red and white will even be pretty for Christmas time! Aren’t these the cutest little jello shots ever? I was worried the flavors would be over powered by the rum, but the sweetened coconut cream is compliments the rum, the pineapple adds to the flavor, and the cherry makes the pina colada combination POP! Speaking of Pop… don’t you want to pop these little beauties in your mouth. You can even grab them by the stem! This recipe was made with Batiste Rum and all natural ingredients. I hope you enjoy these little layered jello shot treats as much as we do! 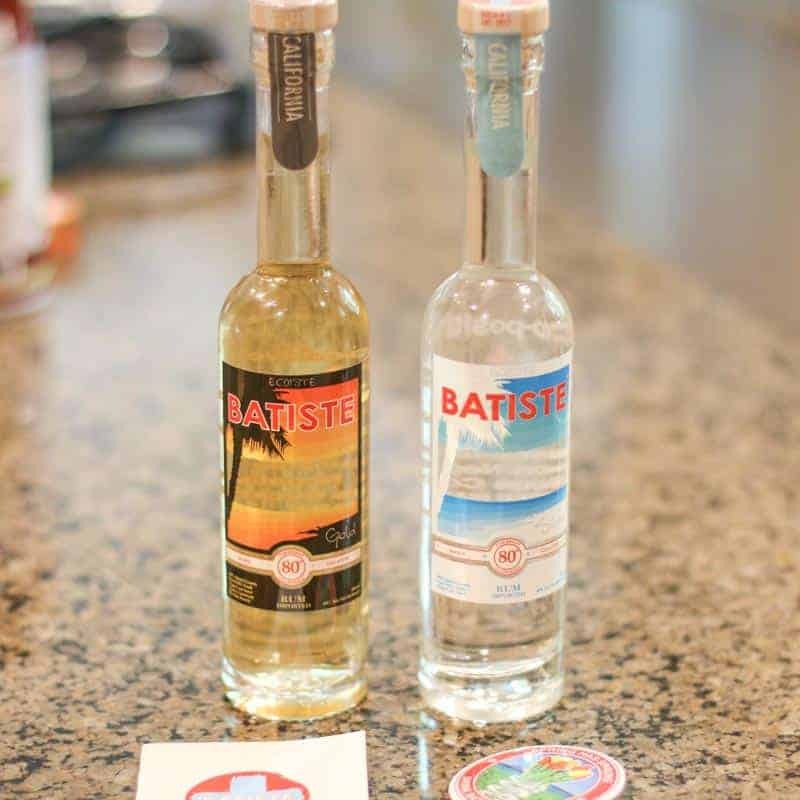 Batiste has a nice list of other fun drink recipes if you need additional inspirations. Cheers! Rum Jello Shots for everyone! (21 and older, that is.) 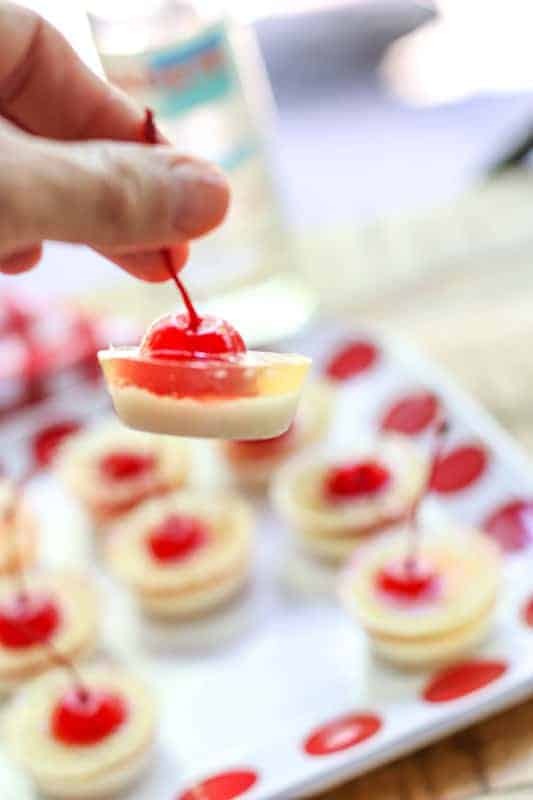 Easy to make; these pretty tropical Pina Colada Rum Jello Shots start with a creamy coconut bottom layer, a delicious pineapple flavored center, and a sweet cherry to top it off. You can pick them up by the cherry stem and pop them in your mouth. How fun is that? Prepare a mini muffin 24 cup pan with coconut spray. In a small sauce pan, cook on medium heat coconut cream. Add in 2 gelatin packets. Cook and stir until completely dissolved (about 2-3 minutes). Remove from heat. Mix in 1 cup of rum. Pour half way up in each little mini cup. Refrigerate until set and firm (about 30-45 minutes). Cut a small slice off bottom of each cherry keeping the stem. 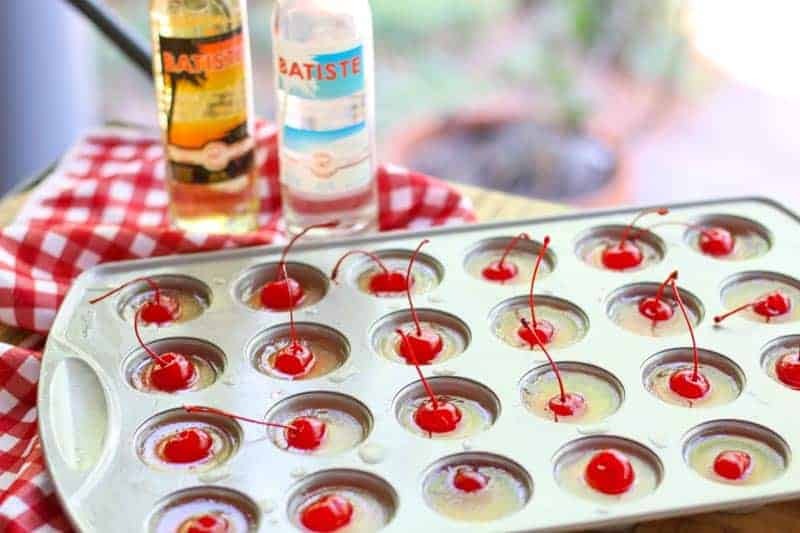 Set cherry in the middle of each mini cup. In a small saucepan, cook on medium heat pineapple juice. Add in 2 gelatin packets. Cook and stir until completely dissolved (about 2-3 minutes). Remove from heat. Mix in 1/2 cup of rum. Top each little mini cup with pineapple mixture. Refrigerate 3 to 4 hours or until completely firm and set. To pop out each jello shot, gently run a knife around the edges or use a small spatula to remove them. Serve. Oh yes, these cute jellos look so good, what a clever idea. I must make them for my next garden party. Thank you for sharing. These are so cute (in a grown-up way, of course!). Such a fun idea for a party.